Build Your Own Kite Skates! High speed kite-powered skating is one of my biggest thrills. But when kite skating on paved parking lots was our only option, we couldn't compete with buggies on grass for spectator interest. That's what led me to engineer the contraption that would allow me to kite skate on the flying fields. These off-road in-line skates are made using very available components; scooter wheels. Irreverently dubbed the Wheels of Doom due to their "lack of good sense" appearance, in fact, if properly made, these kite skates are quite stable, safe - and fast. Anyone who knows how to skate and how to fly a kite can put the two skills together and kite skate in style. * One pair of good-fitting in-line skates. * Four Scooter wheels and tires of 12-inch diameter can be purchased from most bicycle shops. It is advisable to spend a little more and get the puncture-resistant inner tubes. Note: Avoid using small wheels. An outside wheel diameter of less than 10 inches will result in a hard and bumpy ride with less traction. Most importantly, small wheels will cause the skater to stumble over any little hole or bump on the surface (at high speed, this could be a dangerous situation). The larger wheels offer a smoother ride, better traction, and the ground clearance necessary for varying terrain. Additionally, I tend to lower the tire pressure to about 20lbs as tightly inflated tires will reduce traction and cause the skates to "chatter" at high speed. * Bearings: The scooter wheels come with standard bearings which are fine for grass, but not for sand or dirt. A bearing company can set you up with a set of sealed bearings that will fit the wheel hub. * 4 steel rails 3/8" x 3/4" roughly 24" to 26" long. Note: It is not possible to offer exact measurements for the mounting hole positions as they change with the size of each skate boot. Position the wheel axle holes as close to the rail ends as possible, then center the boot attachment holes evenly between the front and back wheel holes. When the skate is assembled, there needs to be at least 1/2 inch of clearance between the toe of the skate boot and the front tire, and 1/2 inch between the heel of the skate boot and the back tire. I had a machine shop drill the holes. 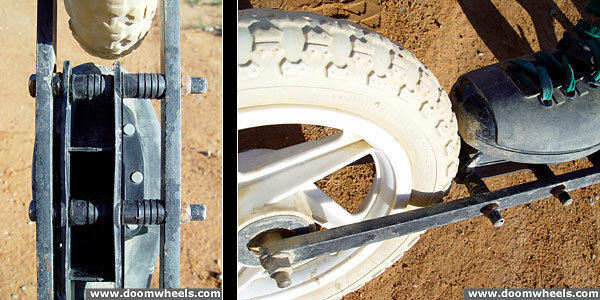 * Hardware: total of 8 bolts/nuts and 24 spacers (8 x 1/4 inch to fit between the inside skate track and the inner steel rail, 8 to fit within the skate wheel tracks where the original wheels were mounted, 8 to take up the remaining space between the outside skate track and the outter steel rail) to mount the skate boot to the rails. 1. 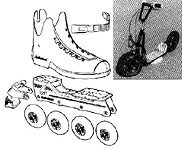 Remove the wheels and brake from the in-line skates. 2. Mount the metal rails to the skate's wheel track by running long bolts and spacers through the existing skate wheel holes. Off-center each boot 1/4 inch from the inside rail (not centered between the rails like an ice skate) to provide more stable balance. This puts your weight force slightly off center and moves the balance point to the knees rather than the ankles. Plastic or aluminum spacers (3 pieces per mounting bolt) can be cut to position the boot at your desired position. *1/4 inch piece between the inner metal rail and the skate track. *One piece cut to the exact measurement of the space within the skate track for support (where the in-line skate wheels use to go). *One longer piece to fill the remaining distance between the outside of the skate track to the outer metal rail. See figure 2 and 3. 3. Offset the front wheel slightly toward the inside rail to improve turning. 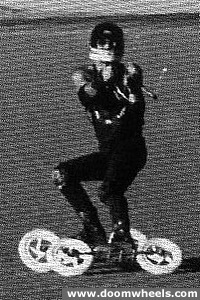 If the wheels are all mounted in the center of the skate rails, the skates will constantly drift downwind as you are powered up against the kite. I built the axles so that I can change the center point of the wheels. My front wheels are moved off-center on the axle bolt so that it rides as close to the inside rail as possible (1/8 inch). This causes the skate to carve a slight turn away from the pull of the kite when you are leaned over. While standing upright, the wheels all run in a straight line. See figure 2. Q. Is there any advantage to lowering the skate platform closer to the ground for better balance? A. In my opinion, there is no advantage to lowering the platform. When you skate with a kite, you are seldom standing vertical. In fact, skating allows you to use a very large kite and control it's power by leaning against the pull. The harder the pull, the greater the lean. There are times when I am leaning so hard against the kite that I can reach out and drag my fingers along the ground. Leaning over this far puts my skate at quite an angle, therefore the skate rail (platform) is very close to the ground. To lower the platform would mean it could hit the ground and the skate would "skip out" (not a very good situation to be in at high speed). Another reason I like the ground clearance is for cruising through varying terrain. Some dry lakes have motocross tracks with jumps and bank turns. Considering that the platform is only between 4.5- 5.5 inches (depending on wheel size / tire inflation / body weight), and factoring the leaning angle of the skate (between 30-60 degrees), I have found that a platform equal to the height of the wheel axles works best. Q. What do you think of bending the rails so they're narrower where the boot is so that the rails attach directly to the in-line skate chassis? A. Not really necessary. Some skaters have done it, but it disables you from offsetting the boot which is important for ankle stability. If you do this, bend only the outside rail leaving the inside rail straight. Then, as mentioned above, mount the skate boot close against the inside rail. The idea is, you don't want the skate boot centered on the wheel axis as it makes standing unstable like an ice skate. Mounting the boot off-center toward the inside locks the balance into your knees rather than your ankles. Be sure to check the "Learn how to kite skate" section of this web site. Contact us with additional questions or check out the Power Kite Forum.